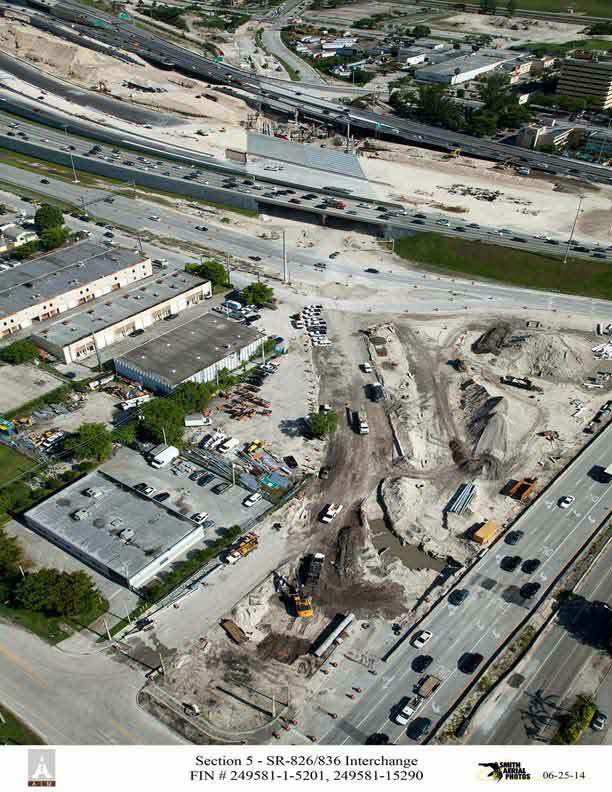 Completion of Miami-Dade County’s most impactful road project – the interchange of state roads 826 and 836 – has been delayed until January 2016 because of inclement weather, but significant milestones have been reached, said project spokesman Oscar Gonzalez. Of the project’s 45 bridges, four are built of 783 individual segments. Each of these bridges weighs 60 to 80 tons, he added. “We just placed the last segmented bridge a couple of weeks ago; two are open to traffic and the other two will be open by the end of the year,” Mr. Gonzalez said. A special crane designed for the curvature of the segmented bridges will be disassembled and is likely to be retrofitted for another job, he said. The 826/836 interchange project, begun in 2009, is a collaboration between the Florida Department of Transportation and the Miami-Dade Expressway Authority. The interchange, which Mr. Gonzalez has described as “a pivot point,” is used by 430,000 motorists each day. When it is completed, drivers going north on State Road 826 will have a direct connection – for the first time – to westbound State Road 836, and then to the Florida Turnpike. As construction pushes forward, drivers can expect more lane closures and rerouting, Mr. Gonzalez said last week. In March or April, southbound drivers on State Road 826 will be encounter construction at Northwest 25th Street. Then, westbound traffic on State Road 836 will be shifted to the future eastbound lanes to allow for the construction on the permanent westbound lanes, and exits that were previously on the left will be temporarily shifted to the right. “Drivers are going to be seeing changes, but we are bringing benefits on line on 836 westbound,” Mr. Gonzalez said. “This will allow us to finish.” The project remains on budget at $560 million, he added. Meanwhile, the Alton Road drainage project on Miami Beach pushes north. It includes the installation of three pump stations (at Fifth, 10th and 14th streets) adding to the new drainage system. It’s an effort to alleviate the perennial flooding problems the barrier island has experienced, which are feared to grow worse with sea-level rise. The project includes rebuilding the roadway, driveways, sidewalk and pedestrian ramps, and building new concrete islands. Some parking spaces will be lost, and the new design includes barriers to prevent left turns at a few chokepoints. The Alton Road project, which began in April 2013, is expected to be completed to Michigan Avenue in August. Exactly what inclement weather did we have to delay this project? So 430,000 motorists a day X at least $2 in tolls = this project should pay for itself in a little under two years. Why are we paying so much in tolls and getting so little? Now what they need to do is create a flyover ramp from east bound 836 to northbound I95 at the Golden glades. the connection from east bound 836 to northbound 1-95 is so bizarrely ridiculous, it almost defies description. it may be the worst roadway connection in the continental us. the only thing currently missing from the 10 minute long folly is a drive down an unimproved dirt road.